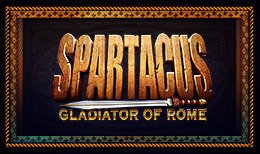 Spartacus Gladiator of Rome by WMS is a Colossal Reels slot i.e. a 2 reels set (5×12 and 5×4). The story is that of Spartacus – an ancient iconic figure who started off as a slave then rose to slave leader and then to the top gladiator in Rome. It has 100 paylines in total and comes with a Free Spin feature, stacked wilds, the Spartacus wild and more. There are 20 free spins up for grabs and stakes start from 50p to £250. WMS mostly deals with land-based slot machines. The company has had several name changes over time starting off as Williams Manufacturing Company to Williams Electronics Inc (1974), Williams Gaming (1991), WMS Gaming (1999) and then Williams Interactive (2012). Spartacus was born in Thrace and became a soldier in the Roman army. He was sold into slavery and trained as a gladiator before he escaped and took refuge in Mount Vesuvius. He led an army which orchestrated a series of Roman attacks which got the attention of the Roman administration. Of course, the Romans set out to defeat Spartacus and his army and were successful. The story has been told in several books, films and TV shows. The game symbols are incredibly done and hold that gladiatorial spirit. The main character is of course the stacked Spartacus symbol which has him in full battle gear clutching onto his shield and a sharp sword. There’s also the stacked female Gladiator wielding daggers and there’s a fierce look in her eyes. Other symbols include; an armoured gladiator, a lion, sword, gladiator helmet, red heart, purple club, blue spade, pink diamond and more. The Colossal Reels layout may be a little difficult to understand for punters who haven’t come across it before. Wild symbol- The wild is represented by the Spartacus Gladiator of Rome logo. It can replace all the symbols on the reels except the scatter. Stacked wild symbols on the 5×4 reel set move on to the Colossal Reel set. If a reel gets wild on the 5×4 reel set, it moves on to the Colossal Reel set and expands and takes over the whole reel. Scatter symbol- It’s represented by the Coliseum which is where Gladiators used to battle in front of cheering crowds. Free Spin feature- It’s activated when 3 or more Coliseum symbols land on the 5×4 reel set and the Colossal Reel set on the 1st, 3rd and 5th reel positions. The number of symbols that land corresponds with how many free spins you win. Each comes with its own multiplier. You get 8 free spins and double your stake when you land 3 symbols, 12 free spins & 5x your stake when you land 4 symbols and 20 free spins & 20x your stake when you land 5 symbols. So, players get 8 to 20 free spins with multipliers ranging from 2x to 20x your stake. The Spartacus wild appears as stacked on the main reel set making all the positions on the reel wild. It transfers over to the Colossal Reels and creates a completely wild reel. Keep an eye out for the Coliseum symbol during the feature because 3 or more reward additional free spins. If you land the 5 high value symbols, you can cash in a big payout. If you’re lucky, you can end up with some pretty impressive wins during the Free Spins feature. The energy the game has is undeniable and it’s more than likely you’re going to get hooked within minutes of playing. It’s got an RTP % of 95.94%.